Our digitally Printed Roller Blinds make a stunning addition to any home or office environment, choose from 100's of stunning images from our GALLERY or use your OWN IMAGE OR COMPANY LOGO. FROM £105. Find your favourite image from our Canvas Art & Roller blind image library. 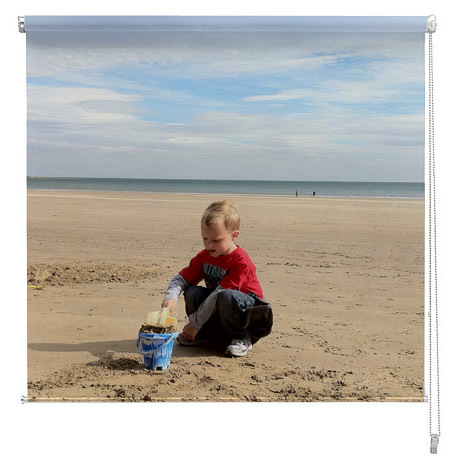 If you have your own image or logo, place your order through our Photo Blinds page. Please note, the sizes and prices on the image page are for canvas art only, the made to measure prices for blinds are on this page. Measure the width of the recess (in mm) in three places using the metal measuring tape, and note the smallest measurement. Measure the length in the same way (taking three measurements), from the top of the recess to the sill. Keep in mind that the fabric will be approx 30mm narrower to allow for fittings. For an EXACT blind size outside recess, measure the width of the window and allow an extra 5cm either side, to help block out light. Alternatively, if the window has wide mouldings, you can measure so that the blind will be flush with the edges. CHOOSE from our HUGE RANGE OF IMAGES or create your own Designer printed blind by sending us your logo or picture. New York printed roller blinds are one of our best sellers, the beatiful picture Of New Yor City look amazing on printed blinds. PRINTED ROLLER BLINDS. Our digitally printed Roller Blinds make a stunning addition to any home or office environment. Manufactured to the highest technical specification, our printed Blinds are custom made to order using quality components.. Have your own photo printed on a blind or use one from our library. CORPORATE LOGO BLINDS. Is it a sign , is it a blind? It can be both! Why have boring blinds in your office when you can have your Logo, Phone number and a picture to make your very own corporate ADVERT BLINDS to face inside or outside. Not found the perfect image for your blinds? Call us, we have a more extensive library of images available available to suit your home or office space, even if its something a little off the wall we will try and find it for you. We can even design something for you, or you can use you OWN PHOTOGRAPH. PRINTED WALLPAPER from £50 per sq m . Theres no limit to the creativity you can create with our wall coverings & murals. You can choose any of our fantastic library of images to make a feature wall that'll get everyone talking. Simply call or email us with your wall dimensions for a quote. Custom made to your measurements. Our printed window blinds are made-to-measure for you. Simply choose from our range of digital images including Floral, Abstract, Graffiti, New York, & Sunsets. You can choose any image from our GALLERY , or you can have your own photograph or company logo printed on a blind. 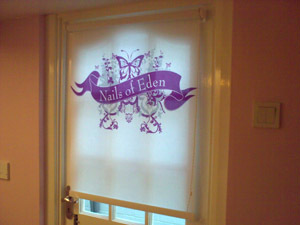 We can print roller blinds from 600mm to 2500mm. 1. Measure the width of the recess (in mm) in three places using the metal measuring tape, and note the smallest measurement. Measure the length in the same way (taking three measurements), from the top of the recess to the sill. Keep in mind that the fabric will be approx 30mm narrower to allow for fittings. This will give you measurements for INSIDE RECESS. 2. For an outside recess blind, measure the width of the window and allow an extra 5cm either side, to help block out light. Alternatively, if the window has wide mouldings, you can measure so that the blind will be flush with the edges. This will give you a FABRIC WIDTH measurement. What is the difference between 'INSIDE RECESS' and 'FABRIC WIDTH'? An 'exact' recess measurement is the one you will need to take when you would like the roller blind to fit and hang OUTSIDE the window recess or flush with your wall. The measurement will be the fabric width you require. The chain is on the RIGHT HAND SIDE by default, if you want it on the left jut let us know. For Roller Blinds other options are available such as mesh fabric, and the chain can be plastic or metal. Our standard dim out blinds are made out of a polyester fabric which is wipeable, fire retardant and crease resistant. What size and quality image is suitable for a blind? Your photograph will need to be taken with a camera at least 4 megapixels and quite high resolution. If youre not sure about an image you can always send it to us for evaluation. Please ensure you have the full copyright or permission to use an image, we reserve the right to refuse to print any image if it risks copyright infringement or is in our opinion offensive. Delivery charge for UK is included. We can also deliver worldwide, although some non EC countries have restrictions on lengths of parcels. PLEASE NOTE BLINDS CAN TAKE 10-14 DAYS FOR DELIVERY.